It rained all day today. A steady, cold, drenching rain. In my twenty-first century, suburban existence, this tormenting downpour has meant nothing but frustration as I ran from my watertight car to my watertight house and back again. But in the middle of the nineteenth century in the middle of America’s heartland, rain could wreak all sorts of havoc. Almost immediately after enlistment, the soldiers of the 36th Indiana found themselves far from home with little in the way of protection from the weather. The several weeks they spent at Camp Wickliffe and New Haven, Kentucky in the winter of 1861 and ’62 were memorable for disease, downpour and diarrhea. Excerpt from Robert Best's Diary entry for November 22 and 23, 1861. From the Allen County, Indiana Public Library Genealogy Collection. Click to enlarge. Excerpt from William H. Thornburg pension application from the National Archives. Click to enlarge. 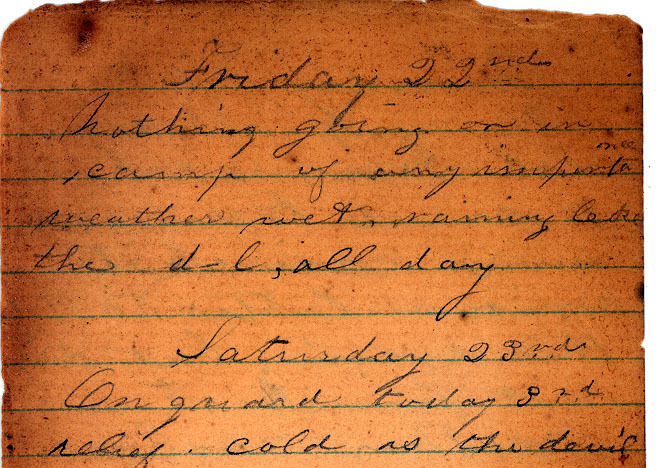 William summarized his experience of Camp Wickliffe by saying, “There was much sickness and I had diarrhea there and got to suffering from rheumatism owing to the rainy wet bad disagreeable weather and the exposure there.” But unlike Robert’s contemporaneous diary, this memory was recalled 34 years later in a pension application. There’s no doubt that there was much sickness and at least some of it was related to bad weather. And there’s no doubt that these boys from the farms of Indiana had a love-hate relationship with rain. When you’re raising crops to support a family, rain is coveted. But when you’re marching off to war–sleeping in fields with thousands of your closest friends–rain is the work of the devil. Blessing or curse, rain was a reality for the boys of the 36th. This entry was posted in 36th Indiana Infantry and tagged 36th Indiana Infantry, Camp Wickliffe, Civil War pension application, diary, rain, Robert Best, William H. Thornburg. Bookmark the permalink. 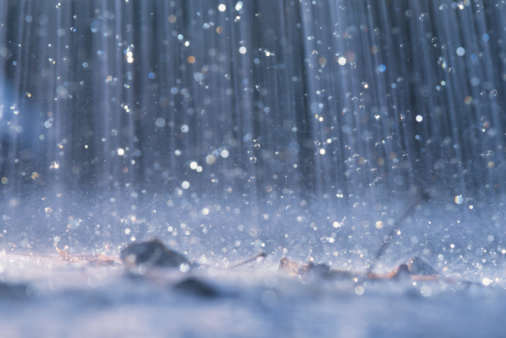 4 Responses to Rain, rain go away! …and i am so happy to be in my nice warm “watertight” house as well!! Robert looked like he had nice handwriting. I wish kids would write in cursive more often. My younger sisters NEVER do. The person writing the pension application did have some nice handwriting, but I’m thinking it wasn’t Robert. I think it was probably a lawyer. When these Civil War vets got older and the government offered pensions, I have the sense that the lawyers got busy (and probably wealthy) filing applications for them. Some things never change. We got your Christmas card today. You have the honor of being our first this year! Very cute pictures. And nice cursive handwriting on the envelope–I’m glad someone at the post office can still read it. Thanks a lot for posting. William H Thornburg (12/9/1832) Of La Porte county Indiana was my great grandfather. He later relocated to Turlock Ca and became a farmer. My family is still in possession of his civil war medals and other memorabilia. I can’t be positive but the writing in the pension application resembles my own fathers writing.